Have you ever wanted a nice bottle of wine with a cheesy slice of pizza? I have, and because I’m not much of a beer drinker, wine has become my meal’s best friend. But what kind of wine would go with a giant slice of cheesy, salty, and crunchy goodness? It can’t be too sweet or earthy and definitely not a dry wine. I know you are dying to know what I ended up drinking in my awesome cat wine glass (which can be seen on the left side of the pizza box if you look really hard). The winner was, blush wine. 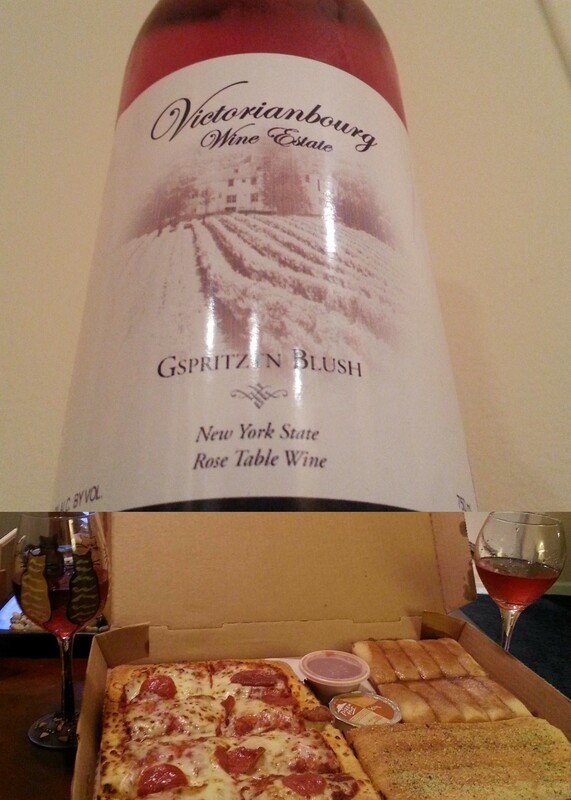 The one that I ended up indulging in was Gspritzin Blush by Victorianbourg Wine Estate in Wilson, New York, which I discovered when I visited the winery this past fall and got to taste this delicious hidden gem. But why is this wine such a good fit? Well, this rose table wine has natural carbonation that acts like thousands of scrubbing bubbles for your pallet. These scrubbing bubbles help cleanse your pallet and allow you to enjoy every delicious bite of food. Also, its natural, light sweetness complements toppings like ham, pineapple, and bacon. Stores that sell wine from Upstate New York may offer this wine, otherwise they currently do not ship their wines, but are hoping to be able to soon. So next time you are kickin’ it with your friends and are grabbing some pizza, grab a bottle of wine too!